Cat Maudy gets her "steering on"! The port side rudder was LOCKED into place. It would not turn – making steering Cat Maudy a challenge. So when we paid a visit to the St. Augustine Marine Center – (who were short on staff due to the December holidays) – we weren’t sure what to expect. Would Cat Maudy need to wait a week to get hauled out for rudder repairs? Could the rudder be repaired with Cat Maudy in the water by the skeleton staff? To our amazement, the moment we arrived at dock – we were greeted by a team of repair specialists — who immediately determined that (a) they could repair the rudder without removing Cat Maudy from the water and (b) they would assign Ronnie to work on it right away. Talk about SERVICE!!! 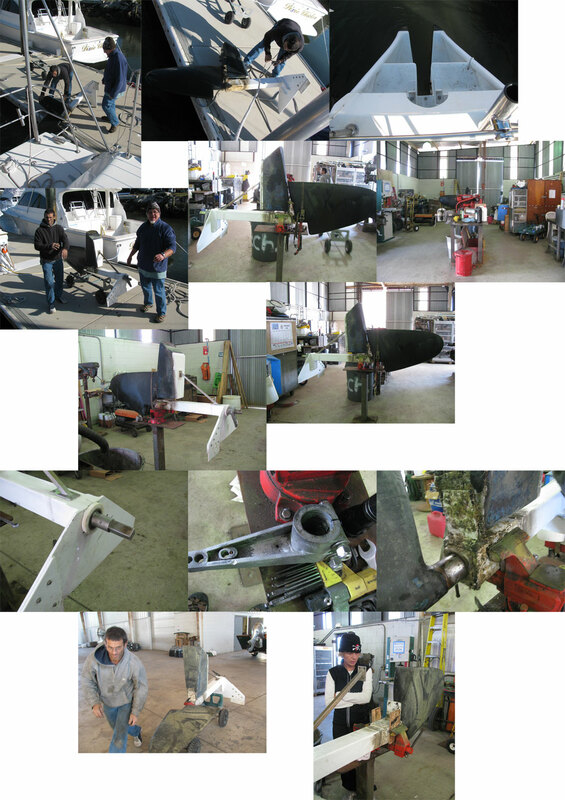 Ronnie and Pat wrestled the rudder off the boat….and wheeled it to the Shop for repairs. The rudder was lifted, so that the shaft could rest on a vice grip….while the bearings and rudder could be dismantled. The end result? The shaft was not bent….the bearings were fine….but the aluminum shaft had corroded around the bearing….causing it to expand and exert pressure on the bearing…and locking up the ability to turn the rudder. Sheezz….a lot of details. I need to go for some exercise. By 4PM (6 hours after we arrived)…the shaft had been cleansed of corrosive pixie dust, barrier goo applied to prevent further corrosion, the rudder assembly restored and returned back onto the boat. Cat Maudy has steering again!!!! Many thanks to the staff at the St. Augustine Marine Center. You guys rock!